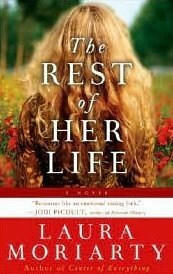 The Rest of Her Life by Laura Moriarty is about Kara, who in a moment of carelessness causes an accident that changes her life and the lives of those around her, forever. I can’t imagine what it would feel like to kill someone, even if by accident. The grief, to me, would be so overwhelming and to be the parent of the person that caused such pain, would be very difficult to deal with as well. Moriarty does an excellent job of portraying what such a situation would feel like. She looks at it from all angles and doesn’t take sides. The scenes between Kara and her mother, Leigh are filled with tension but as flawed as Leigh is, I can relate to her on so many levels. She is like the “mom that tries too hard”. Tries too hard without seeing who her daughter really is. Although I found myself crying a couple of times while reading it (and this hasn’t happened in years) I did find this to be a story about hope. The hope of something better to come. The hope that one day you will be forgiven. The hope that with each day, the pain of loss will lessen a bit. Although this story has to deal with the dynamics between mother and daughter, I don’t feel that you need to have children in order to appreciate what each character is going through. I’ve never read anything by Laura Moriarty, but she has instantly become one of my favorite authors. I thank Jennifer over at Book Club Girl for sending me the book. Jennifer also hosted an on-air radio show with Laura Moriarty. I found the discussion to be very thought provoking. If you’d like to check it out, click here. The Rest of Her Life would make a wonderful book club pick and it would be interesting to see how the other members relate to each character. I highly recommend it. I thought this book was great too. I’ve known moms like Leigh – the ones who try to hard and are almost intimidated by their own children. Great review.